Fallen trees can cause extensive damage to your property. An unhealthy tree may not be structurally sound, putting people at great risk when left ignored. Strong winds from a storm or hurricane could swiftly cause large branches, limbs or even the whole tree to fall suddenly. Contact a tree removal company if you notice any of the following signs. They could signal that your tree is in danger of falling. Trees typically grow straight, but some trees may naturally grow at a slant. It could just be their growth pattern or where they are placed on the property, and they’re probably not a concern. 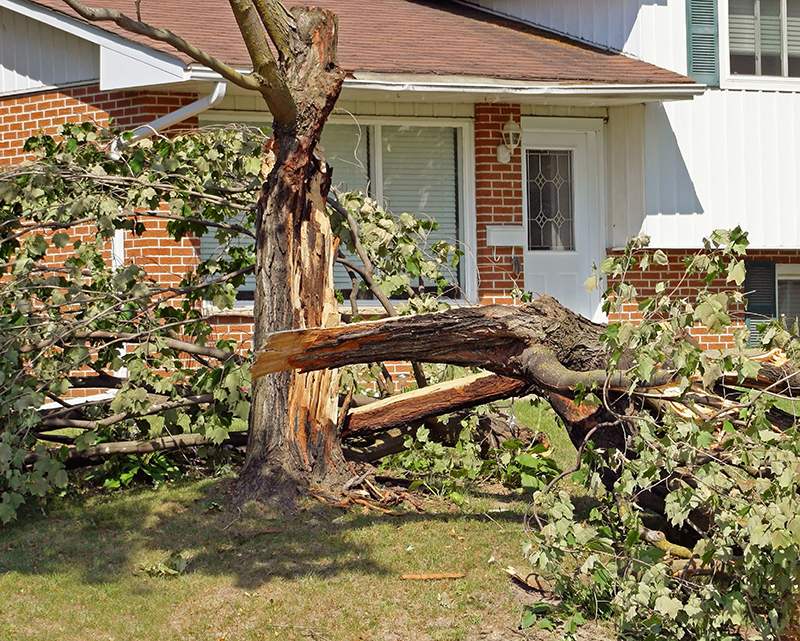 If you notice a tree that is tilted at a more severe angle, however, it could be due to wind or root damage. Look for exposed roots and cracked soil. These could be signs that the tree is at risk of falling over. Call a tree removal company to inspect the situation. Look for signs of disease to know if your tree is at risk of falling. Signs include yellow leaves, discolored bark and no new leaves growing where they should be. Certain tree diseases can severely impact the health and structure of your tree, putting it in jeopardy of toppling over. A certified arborist with a tree removal company will be able to inspect for tree disease. Most tree species will have one main trunk as the base for branches and limbs. A tree that has multiple trunks or trunks that for a “V” shape may not be able to stably support the weight of the tree. This can mean that the tree is more in danger of falling, especially in a storm or hurricane. If your tree is dropping branches, it’s often an indicator that the tree is not healthy. Branches may fall even in normal weather, posing a serious hazard. Have a tree removal company check the health and stability of the entire tree. Seeing cracks and missing bark on a tree’s trunk is a sign that something’s wrong. It could be something called a canker, which makes a tree more prone to breakage in that area. This can put the tree at a greater risk of toppling. A hole in the trunk can lead to decay inside the tree. A decaying tree could be at risk of falling in a storm. It’s a good idea to have it inspected to make sure it’s still structurally sound. If you notice any of the above signs, your tree may be in danger of falling. Contact a tree removal company to inspect your situation. They’ll be able to tell you if the tree can be saved or if it’s safest to have it fully removed from your property. Contact the certified arborists at TREECO, serving Jacksonville and St. Augustine. We can help you ensure that your trees are safe and in good health, and handle any size removal when necessary. Call 904.810.1033.